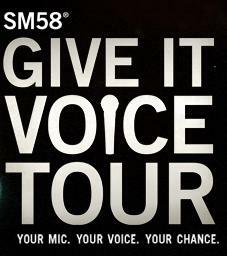 Well, the fans voted and now there’s an official winner for the Shure “Give It Voice” Battle of the Bands Contest. 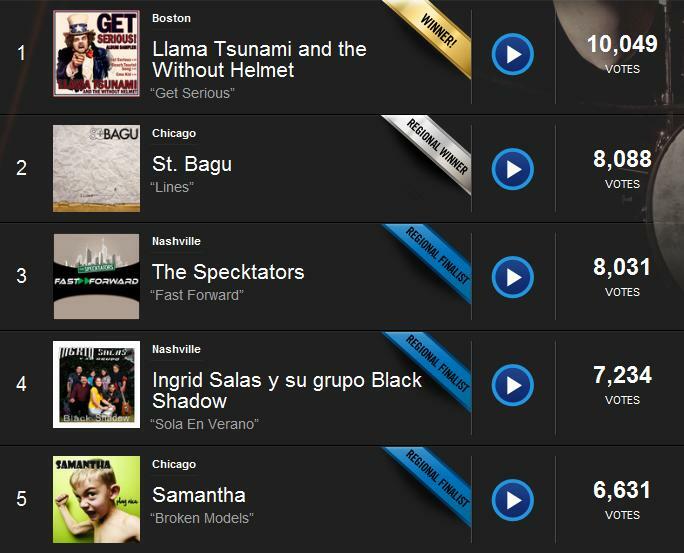 Congrats to Boston’s Llama Tsunami and the Without Helmet for racking up over 10,000 votes to win the Shure BOTB contest! We’ve been following both the Shure contest since it launched in November because a live show and free Shure gear was on the line. So with their victory Llama Tsunami has won the right to play live at SXSW 2011 in Austin, TX during the Red Gorilla Music Festival. And as we head to SXSW 2011 next week, we’re looking forward to catching up with the band to see how their big show goes. But besides discovering some new music and sharing fun contests with you, we’ve been following both the Shure and the Jansport BOTB contests for some other reasons too. We’ve been wondering about the impact of the BOTB contests on the bands, and we’ve been curious to better understand how contests have impacted the fan experience. For starters, during the Regional Showcase phase, I connected with two of the finalists and asked them how their show went and what the vibe was like during their performance. And interesting enough, both bands told me that they won news fans over. And in some cases, even when the bands were performing to a crowd with more fans of the other bands, the band with the less fans in the crowd won. (c) crowd engagement and response. And if the Regional finalists I spoke with were playing to crowds that were mostly fans of the other bands, than it certainly says a lot about their ability to play live. Now, I will say that the bands I spoke with did not win the contest. And I haven’t had the chance to speak with the winning band to get an idea of what their regional performance experience was like. And the other thing that make this Shure contest interesting is that when I watched the performances during the final voting phases I felt that St. Bagu had the most energy, sounded the best across all the performance judging criteria. And their show, when compared with the other finalists, made me wish I was there to see the show live. And if the final voting stage was based on the fan response to videos of the Regional Finalist winners live show performance then I wondering about a couple other things too. Looking at the final vote tally below, it seems like either a) more fans truly enjoyed the performance of Llama Tsunami or b) the Llama Tsunami simply had a more successful turnout during the final voting campaign as they rallied their fans. Who knows, it might be a combination of the two as well? Either way, as we’ve been following the Shure Contest, it’s been fun to see all the bands evolve and grow during the experience. And it’s been fun to watch the fans interact and support their favorite band at the show and in the voting. Did the Shure and Jansport Contests Achieve Their Goals? Does Everybody Win? What long-term impact will the Shure and Jansport contest have on the winning bands and all the bands (check them out: Shure, JanSport) that competed? Will more fans discover both winning bands because of the contests? How did the contest impact the band chemistry and the development of each artist? We’ll have to wait and see to get answers to those questions. I know we’re looking forward to seeing both winning bands perform live at SXSW 2011, and we’ll be sure (no pun intended) to report back on how the shows turn out. And we’re also looking forward to talking with the winners about their Battle of the Bands experience and passing along a few fan stories to you too. If you’re in a band who’s entered, or a fan who’s voted, we’d like to hear about your experience and what you thought of either BOTB competition. Does Your Body Desire The Therapeutic Rumble of Mastodon Live?